Over the past few years we have received many questions about how the Beef Checkoff functions. Not as many, however, about the demand building work that is conducted on your behalf, through the research, promotion and education work the program is designed to do. The questions we are receiving focus on who does and does not pay and who should and should not pay! There also exists considerable misinformation about these subjects so this article will focus on providing clarity. What are the basics of Beef Checkoff Collections? assessment is $1.50 per head if you own one animal or 30,000. Do Importers Pay the Beef Checkoff? YES. There are two points when the Beef Checkoff is assessed on imported cattle. 1. When cattle enter the United States, the US Custom Service automatically collects the federal $1 per head Beef Checkoff on all cattle. This assessment is directly remitted to the Cattlemen’s Beef Board (CBB) where it is used to conduct national beef promotion and research programs throughout the country, the world and in Washington State. 2. The Beef Checkoff is also collected by US Customs on all imported boxed beef. The beef is assessed based on a formula of the live cattle equivalent set by the USDA. The current assessment is $1 per 592 pounds of carcass weight or equivalent assessment of per pound of beef cuts. Again, this money is sent directly to the CBB to fund national level programs. 3. In Washington State – When those same imported cattle change ownership in Washington State, most often when the value is determined on the rail, the Washington State Beef Commission collects an additional $1.50. In fact, most imported cattle are assessed $2.50 per head -- $1 at import and $1.50 at harvest. 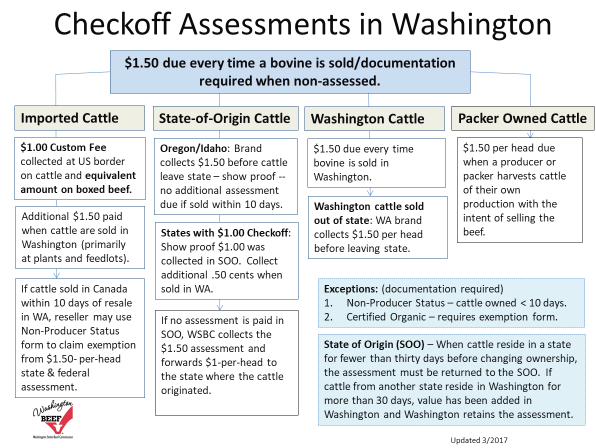 Assessments collected on imported cattle typically represent about 10% of the Washington State Beef Commission’s budget. What about cattle purchased in Canada? If, and when these cattle enter the United States, YES, otherwise no. The Beef Checkoff is based on the laws of the United States, so when a producer or packer purchases cattle in Canada, at an auction market for instance, our laws do not apply. But remember, those cattle are assessed at the border by the US Customs Service upon entry into the United States. Who Collects the Beef Checkoff in Washington State? The Beef Checkoff is collected by packers, livestock auctions and the Washington State Department of Agriculture’s Livestock Identification (Brand) program for private treaty sales among feeders, dealers and individual producers. YES. There are two exemptions that require the proper forms to be remitted at the time of sale to document the exemption. dollars due from the previous owner have been collected. 2. Certified Organic Exemption – Certified organic producers may request exemption from commodity checkoff programs by applying to the national board for an exemption. If the exemption is approved, then the producer must submit an organic exemption certificate each time they sell cattle. Do packers pay the Beef Checkoff? Typically, packers are not producers and serve as collecting points for the Beef Checkoff. However, if a packer owns cattle for more than ten days, they become producers and are required to pay the Beef Checkoff when they harvest cattle of their own production with the intent of selling the beef. Both State and Federal laws address this issue. Is the Beef Checkoff Due on Locker Beef that I Sell to My Neighbor Right off the Ranch? What is the State of Origin Rule? state reside in Washington for more than 30 days, we have added value in Washington and the Washington State Beef Commission retains the assessment. In many cases, the Beef Checkoff assessment is collected by the brand inspectors in the region before leaving the state of origin (such as Oregon and Idaho). In this case, they must present proof (a brand inspection slip) verifying the assessment has already been collected. If they do not, the collecting point in Washington must collect the full $1.50. The rule of thumb -- collect $1.50 or a document! Is the $1.50 Beef Checkoff Assessment collected when Cattle are Custom Slaughtered by a Packer? Not if there has been no change of ownership and the owner simply pays a fee for services to the packer. Remember, the assessment is based on the sale of cattle -- an actual change of ownership must occur. However, they are likely producers selling cattle of their own production and therefore the Beef Checkoff assessment is due in their state of origin. Who Ensures That My Checkoff is Invested Wisely? What is the Role of the Department of Agriculture? plan be reviewed and the annual financial audit be submitted each year. If you have questions about how and when the beef checkoff is due, please reach out to any board member or contact Patti Brumbach at 206.444.2902 or pbrumbach@wabeef.org. Follow our activities targeting millennial consumers on social media at www.wabeef.org and Facebook.com/WABeef.